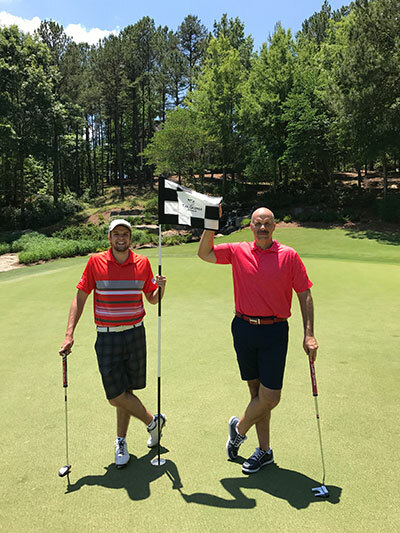 Nestled halfway between Atlanta and Augusta is a massive slice of golf heaven that houses six courses, an ocean-sized lake, a “Kingdom” where golf dreams can come true, a steakhouse that ends each meal with cotton candy, and is the site of an unforgettable handful of days for this dad and his 19-year old son. 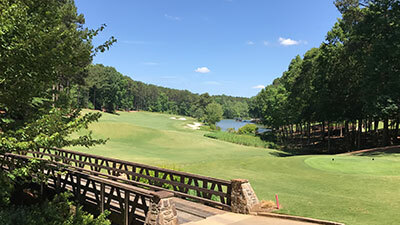 Until recently, this idyllic golf and lifestyle community was known as Reynolds Plantation, but a rebranding and fresh infusion of new ownership led to the name being changed to Reynolds Lake Oconee. While those decisions about names and branding are quite important, we prefer to think of it as golf heaven. Here’s the story of our time at Reynolds Lake Oconee, as told by Dad and Bo. Our journey began with an early morning flight from Detroit to Atlanta, followed by a 90-minute ride through the pearly gates (Georgia pines) of Reynolds Lake Oconee. We were introduced to the spectacular cottage that would be our home for the next few days and were immediately blown away by the tranquility and beauty of the setting. As soon as we pulled into Reynolds Lake Oconee, it became abundantly clear to me that this was no ordinary stretch of land. The gaps through the trees afforded us the opportunity to catch fleeting glimpses of the property’s layout, and what we saw caused us both to become wide-eyed and extremely anticipatory of the week to come. Huge elevation changes, vibrantly blue ponds, lush, green grass, and gorgeous, towering trees were just a few of the things that caught our eye as we drove towards the luxurious cottage we would be fortunate enough to stay in for the upcoming week. In short, the glimpses we caught were enough to make us ready to go play golf at that very moment. Upon arriving at our cottage, we learned that our backyard was the driving range that complimented The National. This provided a view whose beauty is hard to describe, and it also served to increase our itch to play even more. After learning that the range was closed foe the day, we decided to get a flavor of the week to come by going to play what is called The Cove, one of the three nine hole courses that make up The National. Electing to play The Cove could not have been a better decision. The Cove was essentially a microcosm of every piece of beauty we had glimpsed on the drive in. Designed by my dad’s favorite course architect, Tom Fazio, The Cove featured holes expertly carved through the woodlands, beautiful water on at least 4 holes, some spectacular elevation changes, and some really fun par 3’s. Not only was The Cove stunning aesthetically, it also had some teeth to it. Coming from Michigan, where the weather has only recently turned somewhat decent, the green speeds were a wake-up call. More three putts than I’d like to admit happened at The Cove, and this really set the tone for the rest of the week, as all of the greens were similarly speedy. While they were much quicker than I’m used to, they were incredibly true and fair, and a joy to play. Our first full day started at 7 AM. Our host came to our cottage to pick us up and head over to breakfast before our 8:15 tee time at The Landing. If you know anything about me, you’ll know that I’m not the biggest morning person, so as we pulled into the clubhouse restaurant I was still getting my bearings, and I wasn’t entirely sure what to expect from breakfast. Any drowsiness I still had vanished immediately after my first bite of my breakfast. I had ordered French toast, but this was not your grandma’s French toast. This was 4 giant, plate sized pieces of bread, encrusted in corn flakes, topped with lots of butter and drizzled in syrup. You may hear me use the phrase “best I’ve ever eaten” to describe food throughout this piece, but I promise you, I’m not using it in hyperbole. This was truly the best French toast I have ever eaten, and saying it gave me a jumpstart for the day ahead would be an understatement. I wasn’t hungry again until about 6 PM that day. Following breakfast, it was time to tee it up on “The Landing,” a beautiful course from the creative design mind of Rees Jones. Winding through both Georgia pines and running alongside Lake Oconee, The Landing showcases some of the best scenery and topography in the Reynolds golf universe. It truly is beautiful – but don’t confuse that beauty for ease. 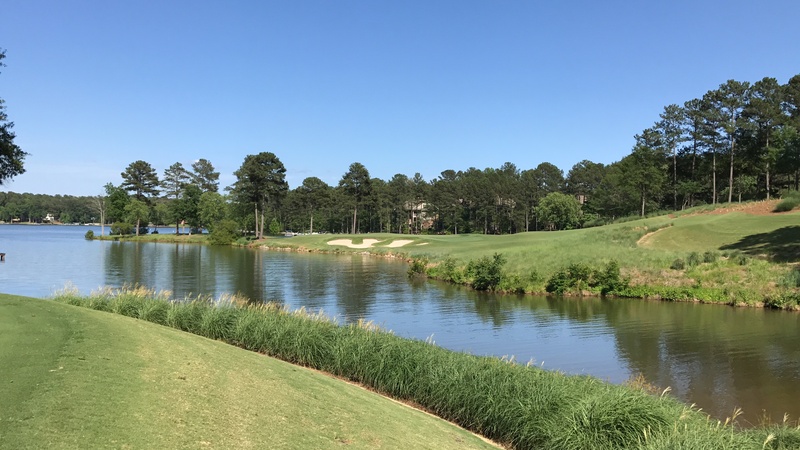 The courses at Reynolds Lake Oconee are intended for enjoyment and a key aspect of that enjoyment is the challenge they present. The greens are perfect, firm, and fast. Very fast. In fact, the pro shop should offer some sort of certificate or ribbon for the golfer who can navigate all 18 holes without a single 3-putt…not that we would be bringing home such an award. A vital bit of background for those of you who are new to our Father/Son travel stories – we love to eat. 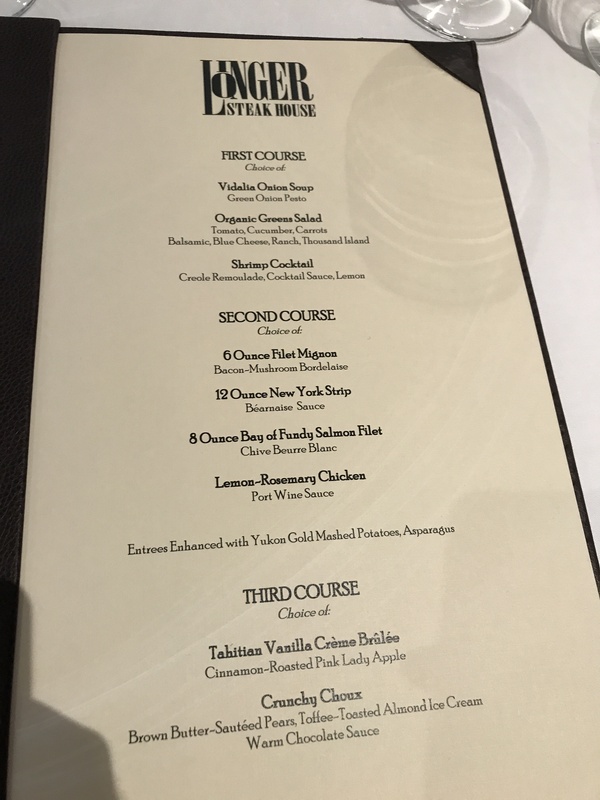 While many golfers will commit to memory the nuances of every fairway, contouring of the bunkers, and quality of range balls, we tend to reserve internal hard drive space (brain power) for especially outstanding culinary experiences. Monday evening was one of those special times as our entire group of writers and golf media were treated to a Georgia BBQ with burnt ends, ribs, and all the extras that made two things abundantly clear – the Reynolds Lake Oconee folks know food and we were going to be in desperate need of an elliptical at the conclusion of this trip. Fans of Homer Simpson will readily recall his food-induced stupors at the end of a delicious foray in the kitchen. Now you know how we felt after this wonderful opening night dinner. It was not entirely certain either of us would be able to effectively swing a golf club after the incredible breakfast that started our day (I ate a slightly lighter portion than the boy) but since we had enjoyed an initial 9-hole taste of “The National” upon arrival Sunday, the chance to play the other 18 holes that Tom Fazio designed was an exciting enticement to soldier on. We were paired with (and schooled by) a pair of Toms (Cunneff and Company) for the round and quickly found that neither Bo or I brought our A, B, or C games to this round. But the lack of quality play by us did nothing to diminish the beauty and charm of The National’s Ridge and Bluff nines. As is always the case with one of my favorite designers, Fazio delivered in fine fashion. Having played Fazio courses in several states and a couple countries, I’m convinced that the game has been blessed with one of the finest artists of the modern era. I love Fazio courses even when playing poorly and putting even worse. Thankfully, the two Toms provided Bo and I with live examples of excellent golf and the morning was a blast for the Father/Son team that could do little right. Following our morning round, it was time for some afternoon fun on the water…and not a moment too soon as the sweltering heat had us wishing for a cool and refreshing dip in the water of a pool or, as it turned out, a lake. 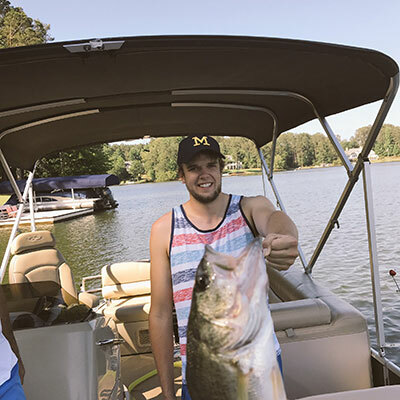 Dad, our cottage-mate David, and I met our fishing guide, Nathan, at the Lake Oconee marina and knew immediately we were in the skilled hands of an outstanding guide and conqueror of all things fish. We took a large and comfortable pontoon out onto Lake Oconee, and we were excited to catch some fish. Nathan was extremely knowledgeable and patient with us amateurs, and dealt kindly with countless snags on docks, trees, logs, and anything else one can possibly snag a hook on. I reeled in two fish, my dad reeled in one, and David was on the receiving end of a no-hitter hurled by Lake Oconee. Despite it being cooler out on the water, this is Georgia in May, and it was still very hot. We realized that were floating on extremely clean and inviting water, so we asked Nathan if it would be possible to jump in. Turns out, not only could we, but Nathan knew of a rock that jutted out from the shore about 20 feet in the air called the “jumping rock”, so we went over to it to jump in and shoot the opening to the video side of our piece. In Michigan, even in the dead of summer, when you jump in a body of water, you typically experience at least a brief shock of cold. I do not exaggerate when I say that jumping in this water felt like jumping into a heated pool. There was no shock. Nathan said the water was probably about 85 degrees, and it felt every bit of that. I could have stayed in that water for about a week. It was perfect. We took our time to swim to the rock, and once there we got on top and prepped for our “jump” off. 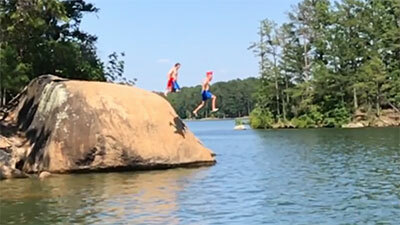 Jump is in quotations because, even though we felt like we had about a 14 foot NBA-caliber vertical leap off of that rock, the video evidence shows us essentially falling into the water. It was extremely fun and well-worth our time, though it was not as heroic, perhaps, as it felt. 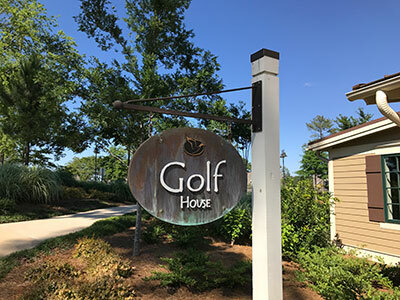 Our final full morning at Reynolds Lake Oconee featured a trip to the Reynolds Kingdom of Golf, a TaylorMade fitting and training facility unequaled in the world of golf. From the latest in technology for fitting clubs and balls to the most enticing and beautiful short game practice area I’ve ever laid eyes on, the Kingdom is stunning. The TaylorMade brand plays a major role at RLO and the Kingdom represents a jaw-dropping commitment to the game that often brings top Tour players on site to tweak, test, and train. Bo and I both decided we could easily spend an uninterrupted month just practicing on the short game area. It’s as beautiful as Augusta National’s Par 3 Course and with enough time in practice, has the potential to eradicate your “scoring zone” struggles once and for all. A brief aside – seeing how beautiful that short game area is makes me wonder why there aren’t more facilities geared to practicing in a setting that’s more special than a large wire bucket of balls being struck from a mat that leaves green residue on your clubs. I’m not talking about a full 9-hole course. Instead, a 4-station practice area that allows golfers to dedicate a couple hours to putting over here, bunker play over there, 75 yard shots over there, and – well, you get the idea. The example on display at The Kingdom is a perfect combination of beauty, training versatility, and an idyllic setting that allows golfers to lose themselves in something we ALL need more of – practice. The concept could and should be replicated across the nation. My home state of Michigan is one of America’s leading hotbeds for golf and yet there are almost no public practice facilities that offer anything other than basic range services. It seems to me that offering quality practice areas would help address the complaint that golf takes too long while at the same time generating revenue for a visionary who creatively packaged “by the hour” rates to practice on real grass to real greens. Our visit to the Kingdom was followed by lunch at the Reynolds Lake Oconee Ritz-Carlton, a stunning luxury hotel that welcomes guests from around the world. The setting at the Ritz couldn’t be more perfect, with the pool and beach along Lake Oconee providing a completely relaxing atmosphere. That same lake (I told you it was huge) plays a key role in The Oconee Course – our next chance to tee it up. The Oconee Course is perhaps the most forgiving of the courses we played, which is NOT to be confused with it being easy. 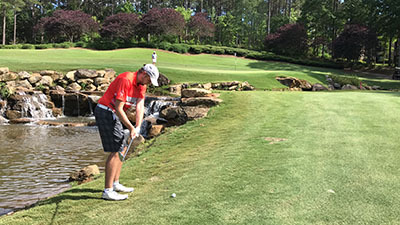 But as one of our playing partners and opponents (in a friendly best ball match) named Elvis demonstrated repeatedly, it’s nigh to impossible to lose a ball on The Oconee Course. Most of the tree-lined holes feed back toward the fairway or offer a cushioned pine-needle surface from which to play errant tee shots. I’ve watched and covered a lot of golf in my career, but Elvis’ ridiculous birdie from the pine straw (hitting hybrid 210 over a creek, sticking it to 4 feet and making the birdie putt) to bring his team back to within one in a match we had sewn up, was one of the most amazing shots I’ve ever seen. In the end, Bo and I loved The Oconee Course, played it decently (while putting poorly on really good greens), and managed to choke away a 3-up lead on the back 9. Still, our final round at Reynolds Lake Oconee was a memorable one because of the beauty of this great course, the fun of the friendly match, witnessing a shot that might never be topped (pun intended), and getting our competitive juices flowing in a halved match. We were sweaty, tired, and ready to kick back and enjoy a concluding dinner at Reynolds Lake Oconee’s famed Linger Longer Steakhouse. Little did I know, the evening would still hold a most surprising turn of events. Our final group meal at Reynolds happened at a place called Linger Longer steakhouse. Remember that name, because before you die, you need to go here. The menu was very simple: choose an appetizer, an entrée, and a dessert. I went with the shrimp cocktail, the 12 oz. New York strip, and the crème brulee. I said earlier that when I use the phrase “best I’ve ever eaten” I mean it. I’m about to use it twice. The shrimp cocktail was the best I’ve ever eaten. It’s obviously a rather simple dish, but the shrimp was so juicy and tasty that it astounded me. This was simply a warm up, however, for the steak. The steak was perfect. Again, this is not hyperbole, it was a perfect steak. Perfectly seasoned, and perfectly cooked. Keep in mind, this was not a small steak. This was 12 ounces, and as thick as a textbook. It was cooked perfectly all the way through, and while I’m no chef, I know that cooking a steak of that thickness to such perfection is not easy. Immediately after finishing the steak, (there was zero evidence left behind) I proclaimed that this was the best steak I have ever eaten. At the time of writing this piece, that sentiment has not changed. The New York strip at Linger Longer steakhouse is my favorite steak of all time. What a way to close out the week. Then came dessert. The crème brulee was, you guessed it, the best I’ve ever eaten. See a pattern here? What was really interesting about dessert, however, was the restaurant’s tradition. After every meal, Linger Longer steakhouse brings out giant servings of cotton candy, like you’d find at a carnival. Yes, this five-star establishment brought out heaping piles of that sugary, fluffy stuff, and I loved it. I’m not even a huge fan of cotton candy, but the tradition is wonderful, and oddly, I thought it fit in perfectly with the restaurant. They serve you the best meal of your life, and then bring you cotton candy. Because when you make food that good, you can do whatever you want. Reynolds Lake Oconee was an amazing place, full of “bests”. We met some awesome people, played spectacular golf courses, ate food that was on another level from anything I’ve had before, and really just had an experience that I will look back on for years to come. Getting the opportunity to go to a place like this and experience the things I did is not something I will ever take lightly, and I would like to sincerely thank the folks at Reynolds for having us, and giving us a week filled to the brim with experiences we will never forget. If you ever get the opportunity to make it down to Reynolds, take it. You will not regret it, and you, like us, will have unforgettable memories that are full of “bests”. As has been the case with every Father/Son trip we’ve taken together, I come away from our Reynolds Lake Oconee trip thankful for a marvelous destination and even more overwhelmed at the tremendous blessing that comes from being able to spend time with my son. During his younger years, I would often take trips like this by myself, joining other members of the golf media for a few days. It was fun, but somewhat hollow in comparison to now being able to explore and experience destinations with him. His love of the game, respect for it, and improvement playing it has elevated these excursions to the top of the leaderboard for this dad. Having said that, this dad can’t think of a better destination for fathers and sons looking to get away and soak in one of the most beautiful parts of the nation. I would say to go find “something like” Reynolds Lake Oconee and spend time there, but there isn’t any other place to use for comparision. Reynolds Lake Oconee is the finest collection of courses, resort and residential excellence, hospitality, beauty, and overall perfection I’ve visited. Dads – take your sons. Rent a National Cottage for a few days. 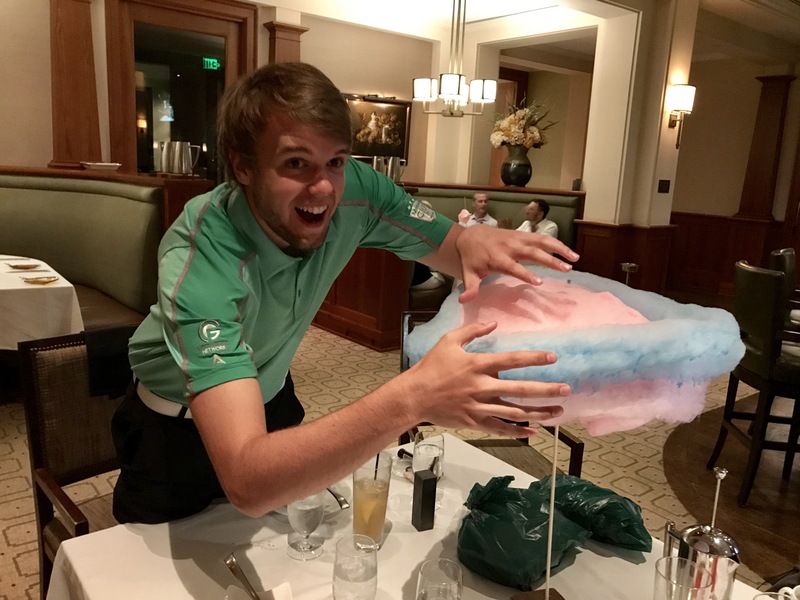 Tee it up in the morning and eat steak and cotton candy at night. Every night. Catch some fish. Jump off a big rock. Do it again. And tuck away all the memories.